An Easy LIFE SAVING Project for Your Memorial Day Weekend! YOUR Very Own War Room! I love having special days on the calendar to say THANK YOU to the soldiers in my life–living and passed. My Honey is a Marine! The USA Armed Forces are certainly worthy of our gratitude but do you know what? There is another kind of soldier. Some of the worlds bravest “warriors” never leave their home. Their battle is fought from the knees. Their frontline is direct enemy confrontation. Their weapon, God’s Word! Prayer changes the world. Prayer saves lives. Prayer opens doors. Prayer gives direction. Prayer heals. Prayer restores. Here’s the thing–prayer requires (YIKES! YUCKY WORD ALERT!!) discipline. My routine for over 30 years has been to record my prayers (i.e. chats with God) in a spiral note book that I decorate for each new season. But sometimes–change is good for refreshing and reviving our prayer life. We all need it to stay battle ready! There is no better weekend than tis to take action! I am suggesting a BATTLE plan for creating a place for your prayers! Your very own WAR ROOM! What explosive joy has you shouting to Jesus – hallelujah! What self-espoused failure has you immobilized for want of a “do-over?” What niggling sensation rests deep in your heart, keeping you up at night? 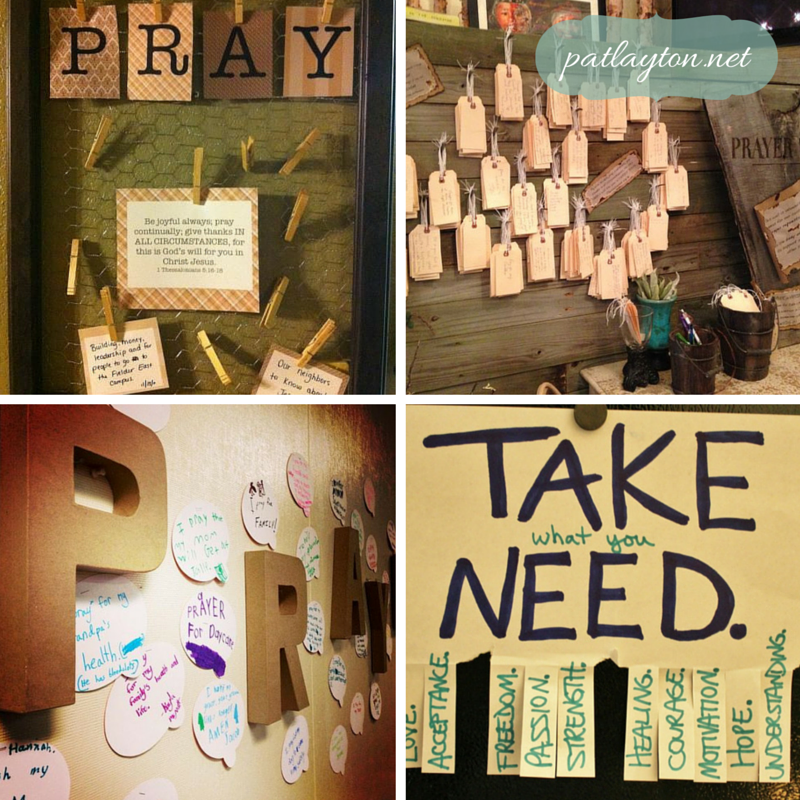 The graphic above gives us 4 ideas I stumbled upon in my Pinterest perusing that struck me as such a simple, crafty way to connect our deepest, most passionate thoughts, needs, words and actions–and make them into prayers! Any of theses would make a cool activity for an individual and/or family to help us keep scripture and prayers “out there” right in your home! What a great way to visualize God’s Word and His answers in our everyday lives AND maybe just start a conversation with a neighbor, family member or friend! Make it pretty. Make it practical. Make it private. Whatever works for you. Hey–If it’s not too personal, please, may I take a peak? If you’d like to share what you create, post a comment or picture below to share!!! Lastly–next week is my JUNE Monthly E-Letter, A Refreshing Pause! I’ll be giving away a few FREE BOOKS including my own book Life Unstuck! If you are not on my mailing list, please sign up on my home page and get not only a FREE GIFT RIGHT AWAY, but have a chance to win one of my MONTHLY FREEBIES!! AFTER THAT, have an awesome weekend friend!! ps–If you haven’t seen the movie “War Room”, I highly recommend you rent it over this long weekend!! You will not regret it! It will remind you of another kind of soldier! Previous Post: « Join me will you? Summer Sizzle 2016!